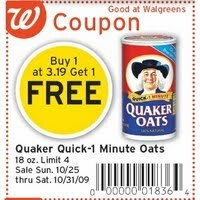 Walgreens: 4 Free Quaker Quick Oats and Profit! Another great Walgreens freebie to score! 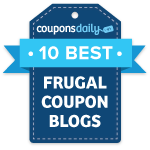 Thru October 31st, Walgreens has a Register Reward deal on Quaker products: buy $10 worth of Quaker products and get back a $5 Register Reward. Plus, like I stated in the weekly deals, Quaker Quick Oats are buy one at $3.19, get one free with the in ad coupon. Combine this sale with the current Register Reward promotion to come out ahead! Final cost: 4 for free + a $1.12 moneymaker!